I’ve been waiting to get a better photo of this before I posted, and look what happens, weeks go by. So you’re stuck with this one. 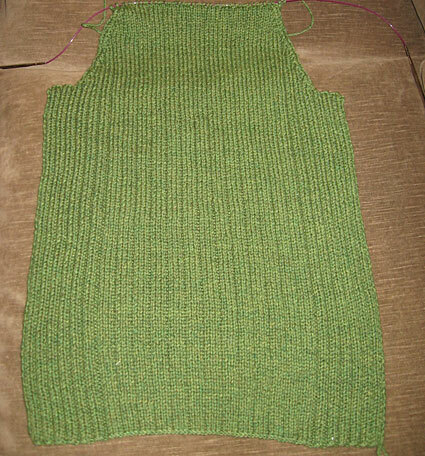 This is the little top I started last year and finally got to finish a few weeks ago. 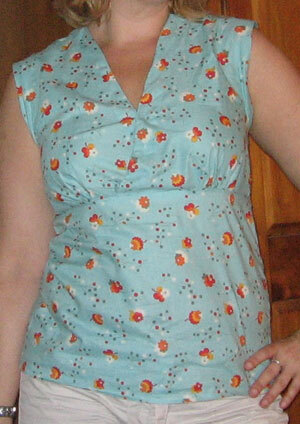 It’s Butterick B4549, and the fabric is Denyse Schmidt Flea Market Fancy collection. 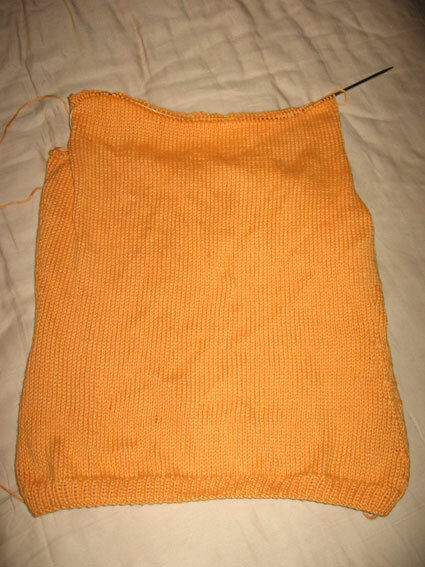 In knitting, well that’s going really slowly. I just can’t get motivated lately, but I just got into Ravelry, so I hope that I get more inspired. Now I have to photograph all my stash, document projects, etc. Hmmm…I can’t even find time to blog. Here’s where I am with the ballet camisole. Other than that, I have been sick (didn’t even go in to my onsite job yesterday) and watching lots of TV – namely Doctor Who and the first season of Roswell. That should be good knitting time, but curling up with the pup is so much more theraputic. There’s been little crafting with all this kitchen stuff going on, and yes, it’s still going on. I don’t know what possessed me when I thought I could do the whole room in 2 days, but it’s coming along. Some deliveries still need to arrive to finish, and I left my floor only partially laid tonight because my hand was killing me from cutting tiles, but by next weekend, all should be done. I have to say, for a small cosmetic only makeover, it’s looking kickass so far in comparison to what it looked like before. 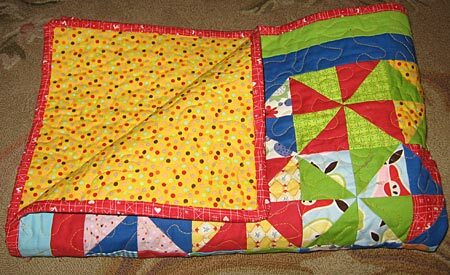 But I took a break from it last night to finish binding the baby quilt. All I need to do is wash it now, and it’ll be ready for my grand nephew. 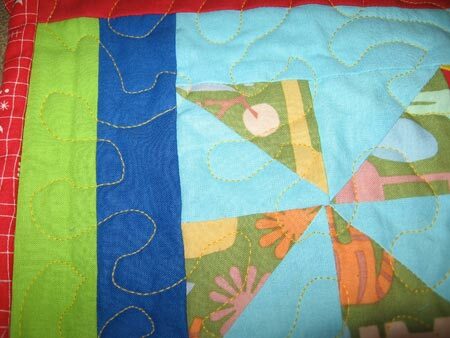 The quilt is not any particular pattern other than a traditional pinwheel, and the rest I just played by ear. It’s my second quilt ever, and first attempt at free motion quilting. I originally tried a stencil but I found for inexperienced me that I did a lot better just going hog wild with the stitching. It ain’t great, but I’m fairly pleased. 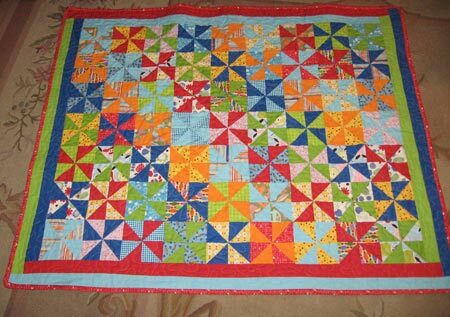 Been working hard on the baby quilt. This is not AT ALL what I had planned. 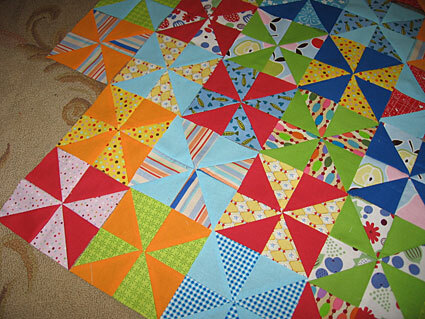 I ended up eliminating one of the fabrics, adding a few others, and breaking it all up with solid brights. It’s REALLY bright. Not so much my taste. But babies love bright colors, and he’ll grow into this well because it’s not so babyish, right? It’s a design still in the works as I am not following any set pattern. These are just blocks, not sewn together, and I keep moving them around. Work is slow, so I have the next few days to work on it with little interruption. 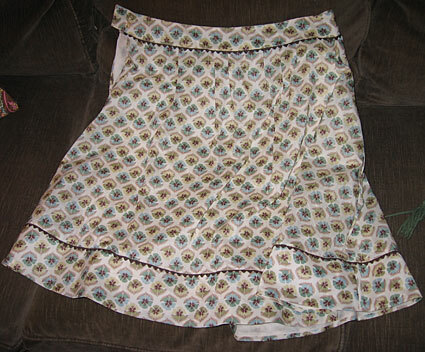 Next, check out this great skirt my mother made for me. She copied the basic style from an Anthropologie skirt I had, but made it cuter with trim and the fabulous Liberty cotton. I love this skirt. I didn’t even *start* my dress yet! And here’s proof I still knit once in awhile. Ribby cardi – Cascade 220.